WHAT IF there was a platform that allowed every citizen to govern Camden together? Browse: Home / 2018 / May / 24 / WHAT IF there was a platform that allowed every citizen to govern Camden together? 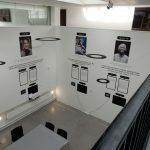 As a part of the MA in Service Experience Design & Innovation at UAL, we were challenged in the Global Design Futures (GDF) unit to discuss the Future of Government. In this post, I present the research and experimentation involved on this topic, leading to five key international design trends that can shape the state of the Government in the future. What will government be like in 2030? This was the provocation that challenged me and my work group in the past months to study, test ideas and more importantly, develop a speculative design project of a Government Platform in the future. 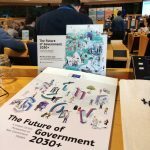 European Commission’s Joint Research Centre (JRC): This project was a part of The Future of Government 2030+: A Citizen Centric Perspective, in collaboration with other five different countries and design higher education institutions. The overall aim of the project is to better understand the changing relationships among citizens, businesses and governments. The previous studies provided different perspectives of the future (scenarios), which served as a starting point for our discussions. Camden’s Council: Sharing their vision of the borough’s future with us, Camden’s Council officers collaborated with a practical local government point of view — showing their plans and challenges for the next decades. Camden’s vision of future local government. In the end, our proposal should be developed based on JRC research and address Camden’s challenges — building a provocation of how the borough could change its policies and public services in the future. Studying the future is particularly challenging because, as Jim Dator (1995) states in his first law of Future Studies, ‘the future’ does not exist. 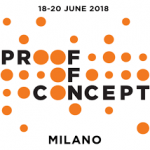 Conceiving the future from where (or when) we are standing is merely looking at a projection of what is happening in the present and trying to devise possible, plausible and probable scenarios and stories. Thinking about plausible future scenarios certainly helps us to address the challenges of the present. In the book Homo Deus: A Brief History of Tomorrow (2015), in which Yuval Harari envisions the future of the Homo Sapiens in the 21st century, he argues that there is no point in making a prediction if it can not change how people look at the present and discuss their current choices. “If the discussion makes us choose differently, so that the prediction is proven wrong, all the better. What’s the point of making predictions if they cannot change anything?”. From this perspective, when presented with the question of governments in the future the first thing we did was to look at current models, studying innovations that could point towards what would come in the following decades. As soon as we started reading about governance in different countries, it was clear that the government of the future would have to overcome big obstacles related to its current model. Our work group is composed by people from different cultures, nationalities and government models, from South America, Europe and Asia. Even so, we all seemed to agree that representative democracy is losing relevance all over the world — specially among the youngest. People are getting less interested in politics and losing trust in the government, not feeling represented by the people who are in power. A research from 2015 called The Millennial Dialogue, conducted by the Foundation for European Progressive Studies with millennials across western democracies, indicates that less than 20% of them are interested in politics (17% in the UK). The video below shows some interviews made with millennials in the UK, reflecting this lack of connection. At the same time that people are getting less interested and voter turnout is reducing drastically every election, the nations themselves are becoming less democratic. The graph above shows the growth of democratic regimes in the 20th century. However, a “democratic recession” is under way. According to The Economist, which have been calculating the Democracy Index of each country in the last 10 years, 2017 has recorded “the worst decline in global democracy in years.”. Despite more than 60% of the world’s population lives in democracies, only 5% lives in what can be considered “full democracies” and the democracy score has been dropping in every region. Between the members of my work group, we all seem to agree that freedom has been declining in our countries recently. In the face of such disturbing evidences, we decided to focus on democracy and how it should be like in the future, after going through all the challenges that are being proposed in the present. There are a few scientists and researchers who are addressing the causes of this crisis with democracy in the last years. It was Larry Diamond (2009), American political scientist, who put forward the idea that despite more than half of the countries in the world achieved democracy, recent efforts to promote democracy have stumbled. In his book: The Spirit of Democracy, he breaks down the reasons of the “democratic recession” in critical states, focusing on macroeconomic aspects like immigration, inequality, populism and corruption. Others, like professor Lawrence Lessig from Harvard Law School, study people’s motivation and see the technology and media fragmentation on the digital world as big factors that contribute to polarisation ant the detachment from politics. In his TED in 2017 (shown below), the professor suggests we should try to find a way for democracy to represent us better, in which people are more informed and able to put their opinion directly to the government. In the book The Third Invention of Democracy (2013), Augusto de Franco, a social scientist from Brazil, proposes that a new democracy should be invented for a Network Society. According to him, representative democracy is in a crisis and a more distributed society (enabled by digital technology) has more conditions to create a new democracy, more distributed and interactive than today’s model. The inventions of democracy: Augusto states there were already two inventions — the Antique and the Modern democracies. For the future governments, a third democracy should be invented. Aspects of this new model, according to Franco. The shape of a future model of government was starting to take form as a concept in our group, but it was still hard to make those concepts tangible into real governance frameworks. For that, I had to look into real-life initiatives. What kind of efforts and processes were being adopted in current times aiming towards a new kind of democracy? A democracy that could be more distributed, and reclaim people’s trust and engagement with politics. A report by Nesta called Digital Democracy (2017) presents a few examples on how different nations are using digital technology and tools to enhance democracy and make it more opened to citizens interactions. According to Nesta, there are different kind of practices being adopted by those in power across the world to increase democracy through digital platforms, like Informing citizens, Citizens providing ideas, Citizens providing technical expertise and Citizens monitoring and assessing public actions and services. Digital Democracy cases mapped by Nesta worldwide. Proposing an idea of project or law — which can be endorsed by other citizens. If approved by 1% of the population, the Council draws up technical reports on the legality, feasibility and cost of the proposal, which are all published on the platform. Every proposal that reaches this stage should be implemented. Debating the idea with other citizens, voting and giving their opinion on government’s proposals. Deciding Budget Allocation — there is a specific budget allocated for all proposals and citizens decide which projects are going to use the public funding. January — February: Residents propose ideas online, being supported by local organisations. Other citizens can comment and debate the idea. March — May: A co-creation process unify projects with similar ideas, bringing people together and forming communities to refine the proposals. Summer: The final projects are shared online for public review. The citizens get together to campaign the idea and the winning projects are selected by a Committee. September: All citizens vote among the winning ideas, either online or in person. December: Most voted proposals are included in the December budget and are implemented in the next year. Residents can follow the implementation process on the website and evaluate the impact of each idea. According to Nesta’s report, “all the evidence show that people who participate today are the people who are already involved in politics.” This happens because “people rarely participate for altruistic reasons — they need to see the benefit of their participation.” Future Democracy platforms will have to consider citizens context and motivations, otherwise they will be always used by the same people for specific interests. Studying the platforms, it was also possible to identify that even if they are easy-to-use, the decision making process itself is difficult, requiring a lot of effort to participate. Digital democracy platforms and technologies from the future will have to make the contributions and interactions as easy and simple to understand as possible. Most of the platforms are good in bringing people together to conceive and propose ideas. However, few of them allow citizens to participate in the implementation of the idea, taking the interaction away in the most important part. Future democracy should give the tools for citizens to get together and act in the delivery stage of each project. After studying the current scenario of government and focusing our attention on Future Democracy, it was time turn our eyes to the projections of possible futures cast by the present. The first step was choosing one of the future scenarios envisaged by the European Commission’s previous research. The research presented three different scenarios, which varied according to the relationship between government, businesses and the citizens. In each possible scenario, the state has a distinct power and technology trends, such as Artificial Intelligence and Data Privacy, are being used differently. We decided to choose the scenario in which the citizens have the most important role, when freedom and participation, therefore democracy, are the core to the solution of society’s problems. The second step was addressing the borough we were designing for. Looking at Camden’s plans for the future, we chose a specific goal for our future provocation. “Camden should be safe, strong and open, and everyone should be able to contribute to their community”. CREATING/ CHANGING SERVICES AND POLICIES: Citizens would be able to make suggestions of changes at anytime and would form communities to deliver them. REPRESENTATION: Councillors would be only users with more “permissions”, with no occasional elections. Elections would happen organically in the platform. BUDGET ALLOCATION: Budget would be allocated organically, in real-time, with the help of the system. REWARDS FOR PARTICIPATION / ENGAGEMENT: Taxes would be integrated in the platform. More contribution would mean less taxes. MONITORING THE RESULTS: Each service should have KPIs that would be monitored in real-time by the system. If something is going wrong, an AI could recommend changes. After the main concept was defined, it was time to make it tangible with a Prototype. Our first prototype idea was a simulation of a future user interface that would present the platform to a citizen who recently turned 18. Our idea was to create a hyper-reality environment, inspired by a speculative design video by Keiichi Matsuda. We used a box with a picture of Camden on the background and hanged sticks with messages and graphs on papers, simulating an augmented reality interface. While the visual elements were being displayed, a previously recorded virtual assistant was presenting the platform by audio through headphones. The sound and the visual were choreographed as if everything was happening live, as part of the same system. Prototype being tested by Council’s officers. Listen to the first audio of the experience. Listen to the Introduction of the platform. As it is not hard to imagine, the whole experience of the first prototype with audio and visuals was more than 10 minutes long. We had to make it shorter to test the concept in a workshop with government stakeholders. In order to do that, we chose a specific theme inside the platform: OPEN BUDGET ALLOCATION. We focused then on the explanation of how an open democracy platform could use people’s and council’s resources in a smarter way — the Artificial Intelligence should be able to test every proposal formulated by citizens to make sure they are evidence-based and evaluate the results to guarantee they are outcome-oriented. For each proposal, the system would calculate the amount of resources needed, making suggestions of reallocation based on predicted outcomes. If approved, the allocations should happen in real-time. Slide used to explain the principles of the Open Budget Allocation. Listen to the audio that presented Open Budget Allocation. With a more focused speculation, we tested the prototype. During two hours we had officers from Camden’s Council and other relevant stakeholders for the project using the mock-up, reacting to the provocation and evaluating the idea. As a result, we could see that people felt stimulated by the experience but detached at the same time. The idea seemed too be far from the current process for budget allocation, making they feel that was not plausible to happen, even in 2030. We knew we were on the right path, but we had to take a step back and study today’s budgeting cycle in local government to bring a provocation that was more related to their perspective. Going back to the metaphor of the future as a projection, we had to go more to the center of the projection making our speculation less about possible futures and more about probable futures. The next days were an immersion in the council’s decision-making process. From this research and talks with experts and tutors, we understood we had to change two factors to make it much more relevant and valuable to the stakeholders. Real-time budgeting was inconceivable to council officers because this is just not how it works. Budgets need to be planned with four years in advance and a considerable part is “locked” to deliver specific services. Understanding this cycle, we then changed our perspective to real-time evaluation. Budget allocation decisions could be constrained by a timeline, but the evaluation if those resources are being invested in a good way should be happening all the time. A real-time evaluation of services should be possible by tracking and processing Big Data and would allow a clear vision of what is working and what should be changed as soon as possible. This intelligence would make every citizen effort more outcome-based, considering the impact of every new proposition with the history of results and predicting possible outcomes. By understanding the decision-making cycle and considering our provocation could be even more related to Future Democracy, we realised that if we were already addressing how resources should be allocated, we could also consider how new services would be proposed and current services changed by the citizens. Moreover, making those projects come true in our future scenario did not only depend from resources from the council, but also from Civil Society Organisations and the people themselves. We decided to take our future vision beyond resource allocation, but to Collaborative Service Innovation in an Open Government platform. Our suggestion on how the decision-making cycle could be opened. PLANNING: A planning period that happens every 4 years in which the outcomes for the next cycle are defined collaboratively by the citizens. TRIGGER: Between planning periods, there is a three years and half period for proposals. The system flags services that are not performing well in relation to the defined outcomes. Citizens who are experts in that field are notified. PROPOSITION: Citizen proposes an idea to change a service or to create a new one. OUTCOME FILTER: After any idea is proposed, the system makes tests – based on machine-learning algorithms – to see if the proposal is able to contribute to the planned outcomes. CITIZEN FILTER: Citizens will discuss, debate the idea and vote if they want it to be implemented or not — the system notifies citizens who are specialists on that issue and the citizens who will be most affected by the idea. SCOPING/ FUNDING: The system will help citizens to calculate the needed resources and put together the people with the right profile to help, creating communities. The funding model is also defined. It can be public funds, partnerships with organisations or crowdfunding. DELIVERING: A councillor is assigned as steward and the project is delivered and maintained by the community. EVALUATING: The impacts of the proposal will be evaluated in real-time by the system, being flagged if they are not performing. Our final prototype (still being built) will apply this process to a case of a citizen who wants to change the library services in the future. Considering all the research and experimentation process that was described in this post, I was able to detect five future trends that would cover our vision of Collaborative Service Innovation in an Open Democracy platform in 2030. As discussed in the first part of this post, representative democracy is going through a crisis. More than the rise of populism and authoritarian regimes, it is clear that digitalisation, making the world more fragmented and small, reducing the influence of middlemen, is changing people’s perception of representativity. As a software that must be updated for a new version of hardware, democracy needs to be reinvented to fit the purposes of a Network Society. As early experiences with digital democracy are showing, the future of democracy involves a mechanism that allow people not only to participate, but to interact in government decision making. In the future, policy making and public service innovation will be even more democratic in the sense that people will be able to engender them in a more distributed way, without the need of representation or hierarchical government structures. In this context, decision-making tends to be more and more local in the future. As we put the responsibility in the hands of the citizens, they will be able to act together on a local scale to change the bigger picture. We already see movements in which technology challenges the concept of the nation state . Also, as seen in the first part of this post, digital democracy initiatives that really are able to impact society are all local. As we walk to the future, people will care less about the nation state, and it will lose importance to the glocal communities, which are collectives that cannot be determined by the geographical boundaries of a country, but by interests and ideas that are able to be locally relevant. As the future opens decision-making to citizens and the state grows weaker (as stated in the JRC scenario), the government will act as a facilitator to shared endeavours. Open democracy platforms will be spaces where people, businesses and civil society organisations get together around common ideas and gather the resources to deliver and maintain public services. Some current digital democracy solutions are embrionary concepts of this idea. In the future however, those platforms should be able to facilitate the delivery, regulating and making it simple for communities to scope and work on new ideas. As stated in Nesta’s report Confronting Dr Robot: Creating a people powered future for AI in health (2018), “ like many digital technologies, AI can either democratise or centralise, empower or disempower, depending on the way it is implemented.” From the perspective of this project, the evolution of Artificial Intelligence will be used to benefit the future model of democracy. For hundreds of thousands of people to interact in an efficient way, there must be some rules and functions which facilitate participation. Trough cognitive computing, the AI will able to identify and act according to people’s profile and behaviour, removing roadblocks in decision making and making participation as easy as possible. The Artificial Intelligence will regulate the platform and the interactions, making the decisions more fair to every citizen. And the citizens will regulate the machine, creating the rules and weighting the system’s recommendations. AI is already being used by advertising platforms like Facebook, to make predictions based on big data and machine learning and generate placement strategy and budget allocation in the most efficient way. In the future this technology will be applied to more complex systems, like public services, generating recommendations on how to improve and manage them in the most efficient way according to the expected outcomes. As citizens worry about the solutions, the system will work to collect and integrate different kinds of data, related to citizens, organisations, policies and most importantly — services monitoring and outcome tracking. In order to contribute with decision-making and act as a guidance to citizens, the AI will be able to learn relating the decisions that are being made with the measured outcomes, predicting the outcomes and making decisions more transparent. Dator, J. (1995). WHAT FUTURES STUDIES IS, AND IS NOT. Hawaii Research Center for Futures Studies. de Franco, A. (2013). A TERCEIRA INVENÇÃO DA DEMOCRACIA. [online] Available at: https://www.slideshare.net/augustodefranco/a-terceira-inveno-da-democracia-29335826 [Accessed 17 May 2018]. Diamond, L. (2009). The spirit of democracy. New York: Henry Holt and Company. Foundation for European Progressive Studies. (2015). Millennial Dialogue. [online] Available at: https://www.millennialdialogue.com/ [Accessed 17 May 2018]. HARARI, Y. (2017). HOMO DEUS. [S.l. ]: MCCLELLAND & STEWART. Kopf, D. (2018). Voter turnout is dropping dramatically in the “free world”. [online] Quartz. Available at: https://qz.com/899586/global-voter-turnout-is-dropping-dramatically-across-the-world/ [Accessed 17 May 2018]. Nesta (2013). Don’t Stop Thinking About Tomorrow: A modest defence of futurology. [online] Available at: https://www.nesta.org.uk/publications/dont-stop-thinking-about-tomorrow-modest-defence-futurology [Accessed 16 May 2018]. Nesta. (2017). Digital Democracy: The Tools Transforming Political Engagement | Nesta. [online] Available at: http://www.nesta.org.uk/publications/digital-democracy-tools-transforming-political-engagement [Accessed 17 May 2018]. Nesta. (2018). Confronting Doctor Robot. [online] Available at: https://www.nesta.org.uk/sites/default/files/confronting_dr_robot.pdf [Accessed 17 May 2018]. The Economist. (2018). Democracy Index 2017. [online] Available at: http://www.eiu.com/topic/democracy-index [Accessed 17 May 2018]. World Economic Forum. (2018). We don’t think the world is getting better. This is why we’re wrong. [online] Available at: https://www.weforum.org/agenda/2018/02/the-short-history-of-global-living-conditions-and-why-it-matters-that-we-know-it?utm_content=bufferb942c&utm_medium=social&utm_source=facebook.com&utm_campaign=buffer [Accessed 17 May 2018].